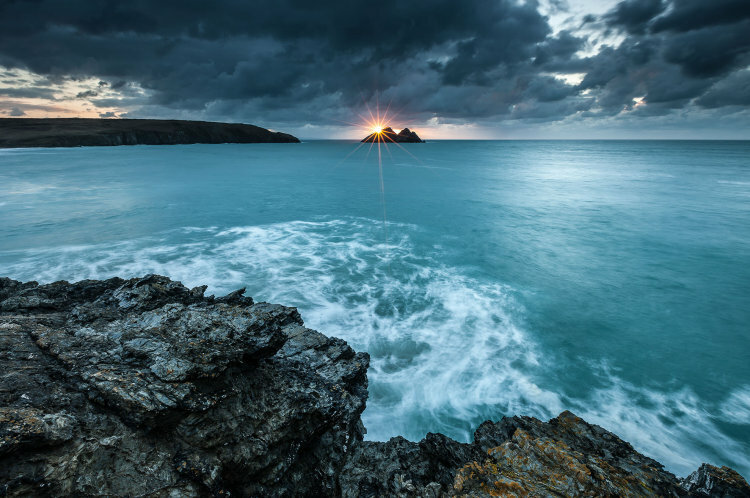 After entering (and winning) two Cornwall-focussed photographic competitions in the last few years, I thought the time was right for me to broaden my horizons and go national. So earlier this year I put some images forward for the Outdoor Photographer Of The Year award. Running through my image library, I laboured for ages trying to 'see' the pictures through a third person's perspective. Putting the heavily filtered long-exposures and freeze-frame captures aside, I picked those that I felt really captured the remote, rugged beauty alongside the atmosphere of the moment. After all, this is the key aim of my seascape photography. I sent off my entries and sat back with a feeling of trepidation as to wether I'd selected the right images, alongside a certain amount of resignation knowing that now there was nothing else I could do. The 'OPOTY' attracts the very highest level of interest and entries from UK photographers, so you can imagine my delight to receive a notification that I had three images shortlisted to go through to the final. I was truly elated and buzzing about on cloud 9... right up until I noticed the detail in the email saying closing date for uploading my hi-rez imagery was the previous day! Through my location work I had been away from my email for a couple of days and had not seen the notification. On the up side this meant I didn't have to worry about keeping the news to myself during a strict 3 day announcement embargo, yet it sent me into a flat-spin of panic as I tried to get the Tiff image files, caption info and mechanical details together. Anyway, I managed to get everything uploaded within a few hours and contacted the organisers to relay my profound apologies for my tardiness... So now all I can do is keep my fingers crossed that the images will be accepted and forwarded into the final. Interestingly, the judges shortlisted three images that were taken at the same location. Kelsey Head is a large rugged promontory that separates Crantock and Polly Joke Bays from Holywell Bay. This is a regular haunt that draws me and my cameras time and time again. Perhaps this is because from my desk I only need to turn my head to look out the studio windows and see what's happening to the sky above this stunning headland. Perhaps it's because it has prominent coastal features and a wave break that works perfectly in a wide angle lens. Or maybe it's because it has a unique rock strata that sees shards of quartz shooting through a micre-rich slate. This combination literally shines in direct sunlight and readily reflects the bounced light of infill flash. This lighting technique is something I regularly use in my seascapes to give balanced foreground detail and textures without reverting to HDR post production jiggery-pokery. An important part of my work is to create imagery 'In Camera' with only considered refinement in Raw and Photoshop. As to the rocks, my darling partner Sam's brother, Zac, is a top mining and tunnelling engineer. He trained down at the mining school in Cambourne and went on to lead the Cross-Rail project in London and is currently overseeing drilling the tunnels for the metro in Riyadh. Zac's knowledge of geology is truly amazing and walking the cliffs with him is a real eye-opening education. For instance, who would ever guess that just down the coast at Bedruthan Steps you can find a rock unlike any other found anywhere else in the world? Zac's explanations as to what incredible forces and furnaces forged the Cornish coastline are hugely enlightening and his observations on the rocks of Kelsey Head form the basis of what I've related here. Anyway, I digress. 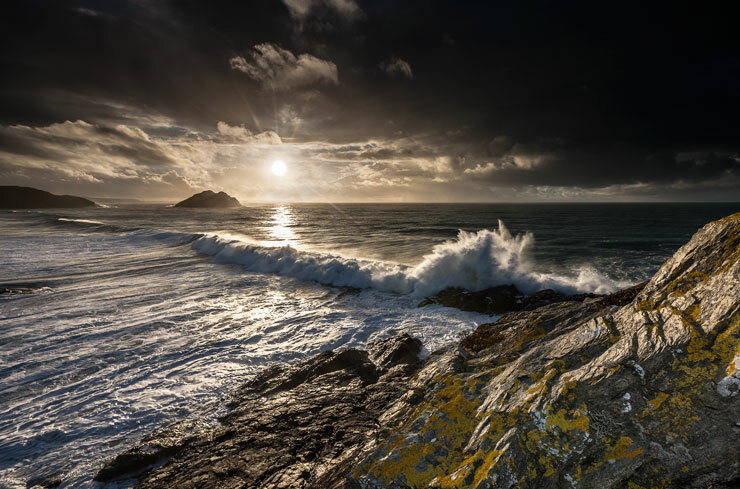 Kelsey Head is a superb location that features strongly in my B&B Seascape Workshops. A number of my clients have captured some really good pictures here and many who return for second or third visits always ask to head there to shoot the sundown. Another point of interest is that the images were all taken in the Winter. Obviously the judges agreed with me that Cornwall's coastline looks great at this time of year.